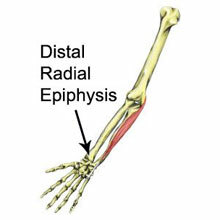 A distal radial epiphysis injury is an injury to the growth plate at the wrist end of the radius bone in the forearm. It mostly affects young athletes and is most often caused by overuse. Resting and changing training accordingly can help, although activities that exacerbate wrist pain should be stopped. It more commonly affects young athletes between the ages of 6 and 10 years old, particularly gymnasts, and can come on through overuse, although fractures following a fall onto an outstretched arm can also occur. The epiphysis is the name given to the rounded end of a long bone also sometimes known as the growth plate and is the part of the bone which is growing. Symptoms include pain in the wrist, especially when the wrist is bent backward with the palm facing down (known as dorsiflexion). They are likely to have limited ability to dorsiflex the wrist which can affect gymnasts from performing certain movements. There may be tenderness and swelling around the end of the bone. There will be no sign however of ganglion cysts, wrist tendonitis or other joint dysfunction which may also present with similar symptoms. An X-ray can help with the diagnosis and the bone on the affected side may look more hazy and different to the other unaffected wrist. In particular, a widening of the growth plate may be seen. If there is a narrowing of the growth plate then a Salter-Harris type stress fracture should be considered. Treatment involves rest and managing the condition by changing the training program to reduce the load on the bones of young athletes and gymnasts. If the pain is present, then activities that cause pain should not be done at all. Strengthening the forearm muscles with specific wrist and hand exercises should be done. This will reduce the load and balance of weight bearing on the wrist which is often overextended to compensate for a lack of strength and is thought to be a significant cause of a distal radial epiphysis injury. In some cases, a splint or plaster cast is applied to ensure adequate rest and recovery of the bones takes place although this is usually only necessary in severe cases. A distal radial epiphysis injury can take months to recover from and should not be rushed.